Hi! 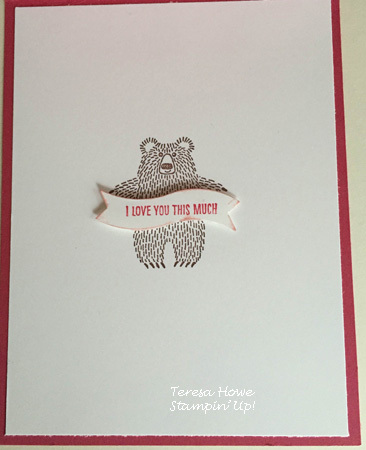 I have another card for you today using the Bear Hugs set as well as Layered Letters. I hadn’t done a Waterfall card in quite a while and thought it would be fun to do for this weeks Global Design Project challenge #GDP020 – CASE the designer! I was inspired by the theme of Connie’s card. Each letter flips up and then slides behind – pretty cool! I had fun playing along with the GDP challenge this week – hope you will check it out via the link above and play along, too. They are a great site for inspiration! Your moving strip is 8″ x 1 1/2″ – scored at 1 1/2″, 2 1/4″, 3″, and 3 3/4″. The white moving strip is attached ONLY to the chocolate chip strip – after folding on the 3 3/4″ score line, attach the front bottom edge of the moving strip to the chocolate chip strip – aligning the two edges. The back of the white moving strip should be underneath the chocolate chip strip. 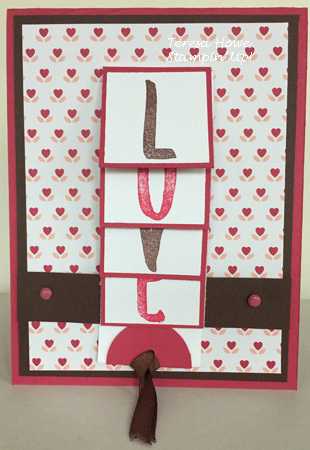 L O V E are on 1 3/8″ squares and matted on 1 1/2″ Rose Red squares. When attaching the letters to the moving strip, start with the E and build your way up to the L. Place Tear & Tape right below each of the score lines to attach the V, O and L.
I hope my tips help! This is super cute Teresa! 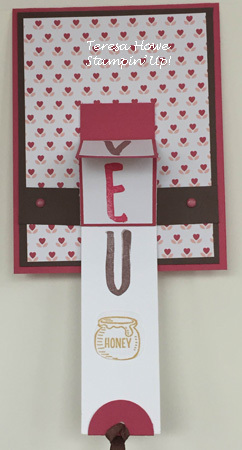 I love the hidden honey pot and then that cute little bear on the inside. Gorgeous! Thanks for joining in on this week’s Global Design Project. Teresa, I L-O-V-E that you created a waterfall and focused on the theme of my original inspiration card. This card is a beauty. Thanks for joining us this week at Global Design Project. What an adorable ending to a fun waterfall! Such a great card! Thank you so much for playing along with this week’s Case the Designer (Connie Collins) Challenge at Global Design Project. It has been years since I did a card like this! I love it! Thank-you for taking the Global Design Project Challenge!